Well, let's start with the errors in fact and then work our way to the conclusions. First of all, it is clear that no research was done regarding certain facts. Yes, yes, I know it's a PLAY, but even plays must answer to facts. Besides, there's more than enough fantasy behind the author's conclusions without pretending that the author has even known anyone in the military. For instance: on page 21 the author implies that Rick (one of only two characters in the play, thank God) was made a Military Policeman after he joined up "because he had experience in security." In fact, a quick call to the local Army recruiter would have provided the fact that the Army signs a contract with the recruit before they ever raise their hand to take the oath and the recruit will be shown a large number of possible options, from Air Defender to X-Ray Technician. The Army doesn't pick the MOS, the recruit does. Second, Rick says he was stationed in Kuwait, Saudi Arabia and Iraq. After 9/11. You see, the KSA had mostly Patriot units stationed on its soil in the 1990s and was never really that comfortable doing that. Following the start of operations in Iraq our presence in Saudi Arabia dropped to almost nothing except the occasional exercise involving aircraft. So Rick would never had been sent to Saudi Arabia in an MP company. On Page 63 we have a discussion about how President Trump doesn't like to shake hands. Obviously the author has never been to a MAGA event, but that would kind of go without saying. 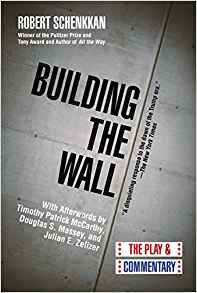 Finally, we get to the fantasy part: by building a wall to protect our borders and enforing our existing immigration laws we will wind up building death camps to kill illegals. Rick is put in charge of one of these camps because he must have been a sergeant or a specialist or something and naturally multibillion dollar corporations are looking for savvy NCOs to run their multimillion dollar facilities, especially if they intend to kill people. The conclusion is breathtaking. I only marvel that it takes some 108 pages to get there. You see, this is a liberal fantasy in which instead of just CALLING people who support President Trump Nazis we have created a whole series of "future events" which actually results in them BEING Nazis! Oh, and the author gets to denigrate all those things he dislikes: privatized prisons, police (who are all racist), George W. Bush, people who claimed that undocumented immigrants were bringing back eradicated diseases to California (they were), Republicans, the Wall and, of course, Trump. In this fantasy America Trump has been impeached (and no doubt via some means not outlined in the Constitution Hillary is now president) and countries like Mexico are refusing to take their citizens back. Hm. Could they watch Fox news and realize that some of these people committed heinous crimes after being deported from the U.S. several times. Really, I can't imagine sitting in a theater and listening to two characters go back and forth, with one mouthing DNC talking points and the other a victim of circumstance but still contemptable because he supported president Trump. Oh, and thank God for the "commentaries," which give us goodthink. Why, if not for this book I might not have been aware that "illegal immigration ended nine years ago."